I’m a creature of habit. I have a morning routine that sets the tone for my whole day. I tend to read my favorite blogs in a certain order. And as odd as it may sound, I have routines within routines. Like I always floss and THEN brush (right, Christy??) The honey ALWAYS goes on the yogurt before the banana. And I even put my rings on in a very specific order. It used to be a mindless activity – putting my rings on. But as I’ve received and purchased rings over the years, each one has taken on a meaning – and been given a priority. The first ring I put on my hand is a simple band – but it says “faith”. On the inside, it says “Live by faith, not by sight.” Putting this ring on first reminds me of my first priority: to ‘Love the Lord your God with all your heart and with all your soul and with all your mind.’ (Matthew 22:37). The second ring I put on? My wedding band. It reminds me of the love between my husband and I, and also, that my marriage is second only to God. Keeping God as the first priority will enable me to ‘Love your neighbor [husband] as yourself.’ (Matthew 22:39). The third and final ring I place on my hand is my engagement ring. I’m still thinking about exactly what priority it symbolizes. Of course, it’s a reminder of the initial commitment between my husband and I, and it reminds me of all of the circumstances and events that brought us together. It may seem insignificant – the order in which I put my rings on each morning. But every day – whether it’s a hurried affair or a leisurely moment – I am reminded of my priorities. 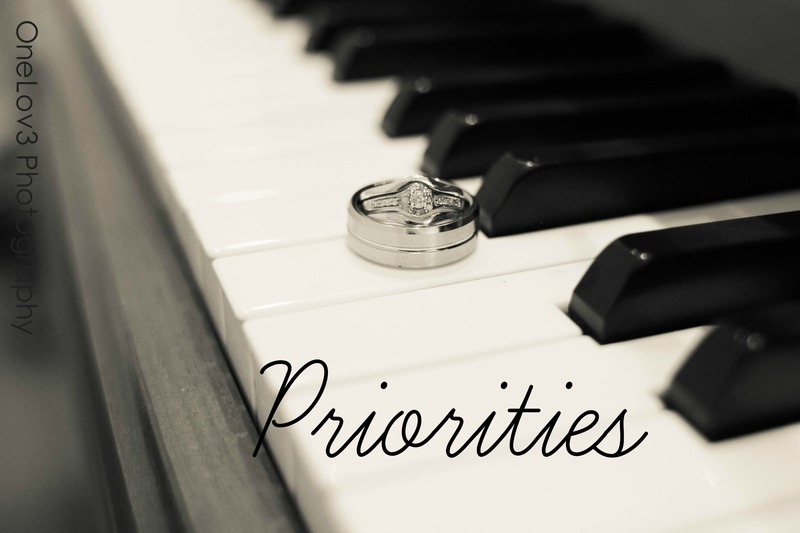 What in your life serves to remind you of your priorities? Posted in Uncategorized and tagged God, Love, Marriage, Priorities, Spirituality. Bookmark the permalink.